Melbourne Cup winner Cross Counter is to be aimed at the Dubai Gold Cup at Meydan on March 30. 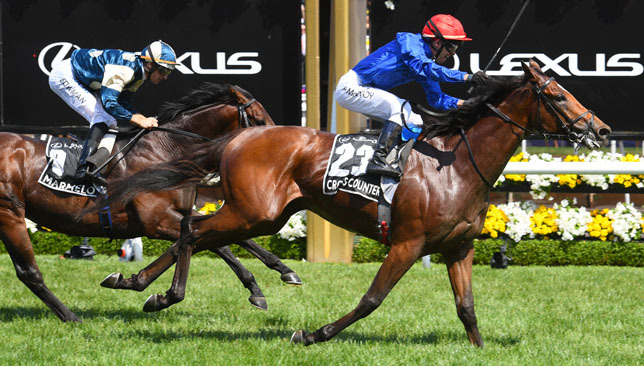 Charlie Appleby’s four-year-old was a historic winner of Australia’s greatest race as the first to be trained in the UK. He came from the rear to defeat Hughie Morrison’s Marmelo, with Charlie Fellowes’ Prince Of Arran completing a one-two-three for the Brits. “Cross Counter has come back from Melbourne stronger and brighter than ever, and he has put on 25 kilos in body weight. He looks great,” Appleby told www.godolphin.com. “After discussing his programme with His Highness Sheikh Mohammed, we have pencilled in the Dubai Gold Cup as a starting point for 2019, and we will see where that takes us. “It will be an opportunity for His Highness to see Cross Counter on the big night, and also for Godolphin fans in Dubai to give the horse the ‘home town’ welcome he deserves. 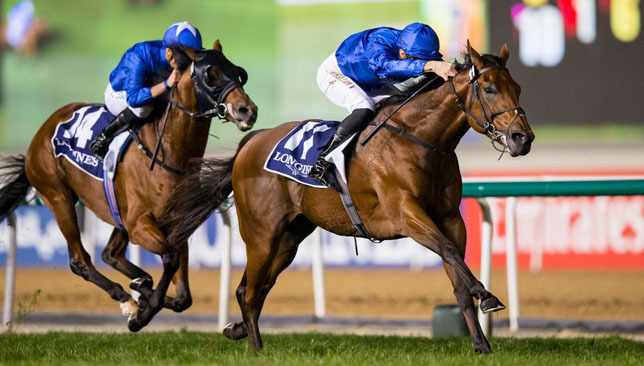 Appleby also revealed that Old Persian, who beat Cross Counter in the Great Voltigeur, will be aimed at the Sheema Classic; Brundtland could join Cross Counter in the Gold Cup; Loxley is to be aimed at the Dubai Turf, and Blue Point the Al Quoz. Dream Castle was an impressive winner for the Godolphin team in the Group Three Singspiel Stakes on the opening card of the Dubai Carnival at Meydan. In a race totally dominated by Godolphin, who were responsible for the first five home, it was Dream Castle (12-1), who came out on top with a dominant display to win for the first time since making a victorious debut at Doncaster in April 2017 after which he was fifth in the 2000 Guineas. The son of Frankel came good as he showed a decisive turn of foot when stepped up to nine furlongs for the first time. Ridden by Christophe Soumillon, the Saeed bin Suroor-trained five-year-old beat stablemate Racing History by a length and a half with Charlie Appleby’s Salsabeel a head away in third. Bin Suroor’s Team Talk was fourth with Bay Of Poets from the Appleby stable fifth. “He ran a huge race. The trip really suited him well and it gives us confidence for the future to run him over the same trip,” said bin Suroor. Stablemate Bin Battuta (11-4) could be bound for the Dubai Gold Cup back at Meydan in March after overcoming 495 days off the track with victory in the Longines Gents Record Collection Handicap. The five-year-old burst through a gap a furlong and half from home in Soumillon’s hands to lead home a one-two for Godolphin this time by beating the Appleby-trained Ispolini by a length and a half. “We gave Bin Battuta a long break after his last run and he looks much better physically now – he is a different horse in the mornings compared to previously,” bin Suroor told www.godolphin.com. “The pace wasn’t too quick, but Bin Battuta was always in a nice position tonight and finished his race well. “I think a mile and six furlongs or further might suit him better in the future. We will probably run him in another 12-furlong handicap and then look at Group races for him. Newmarket trainer George Scott’s first runner at the Carnival was a winner thanks to Another Batt (12-1), who took the Longines Master Collection Moon Phase Handicap for Excel Racing, whose members include Southampton striker Charlie Austin. The four-year-old was produced by Connor Beasley with a long run in the centre of the course to beat Godolphin’s Top Score by a length. “He’s a horse that seems to love travelling. He went to Turkey as a two-year-old and won impressively and he has thrived out here,” Scott told Racing TV. “He’s a really talented horse. I probably over-raced him as a two-year-old. He is improving. “He was shuffled back early on in the race, but I did say to Connor he loves passing horses. Richard Mullen had the race won a long way from home on Raven’s Corner (7-2) in the Dubawi Stakes. The six-year-old, trained by Satish Seemar, had the toe to keep with the pace-setting pair of My Catch and High On Life in the early stages before being sent on early in the straight. Drafted made up a lot of ground to take second place in this Group Three race over six furlongs, but was too late to trouble the winner and was a length and three-quarters down at the line. Al Hayette (12-1) came with a rattling run on the outside to spring a surprise in the UAE 1000 Guineas Trial. Owned and trained by Ismail Mohammed, the daughter of Union Rags stayed on strongly in the final furlong for Fabrice Veron to score by two lengths from Nashirah. Jim Crowley enjoyed a success for his boss Sheikh Hamdan Al Maktoum when steering Faatinah (4-1) home by two and a half lengths from Irish raider Hit The Bid in the Longines Ladies Record Collection Handicap for Australian trainer David Hayes. 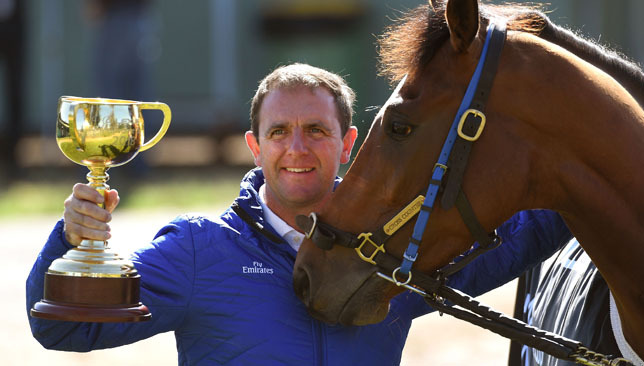 With landmark victories gained in the Derby and Melbourne Cup, it is safe to say 2018 is a year trainer Charlie Appleby will not be forgetting in a hurry. Building a team capable of fighting on every front has not been an overnight process – but after laying down solid foundations since taking over Moulton Paddocks in Newmarket, the 43-year-old reaped the rewards in a campaign which was nothing short of phenomenal. Appleby said: “Five years ago when we opened Moulton Paddocks up to the media, the one thing I said at the time is that we knew what the goals and the vision were within Godolphin. In a year packed full of milestone moments, selecting one that stands out above everything else is a tough call – but in the eyes of Appleby the victory of Masar in the Invested Derby at Epsom in June is the clear pick. He said: “We kicked the year off in Dubai on World Cup night with Hawkbill and Jungle Cat both winning Group One races. “We left Dubai on a high and from the moment we touched back down in Newmarket the winners kept flowing at the Craven and Guineas meetings. “We rolled on to Epsom and there is no doubt it was the highlight of the year Masar winning the Derby, it will go down as my best day in racing and more importantly Godolphin were back winning a Classic. “I went into the race open minded, as Saxon Warrior was the one everyone was talking about – rightly so on the back of his Guineas success in which Masar finished third. “The question mark was the trip, but we were very confident he would get it. The race itself at the time was enjoyable to watch. “They went a sensible gallop and everything went very smoothly and from two down I knew they had us to beat. “The aftermath was something I will never forget, seeing the delight on the face of Sheikh Mohammed and having the royal family there as well. “We all know what Sheikh Mohammed has done for racing and there was not one person on that racecourse that was not delighted to see him win and to be the person that delivered it was very special. “The one thing Sheikh Mohammed said after the Derby was that we can now go to Royal Ascot and enjoy it. Taking on the best the world has to offer is a different ball game and the Breeders’ Cup victory of Line Of Duty would in most seasons would be an exceptional triumph, it was one that was surpassed by Cross Counter’s moment of magic in Flemington. Appleby said: “Any winner at these championship meetings takes a bit of doing, as it is hard enough getting there. “Above all it was a Galileo that produced our juvenile winner at the Breeders’ Cup and that showed where we are now in the game. “It was just great to have a winner on the world stage, while Wild Illusion lost nothing in defeat having won two Group One races before that. “Victory in the Melbourne Cup was sweet, though, as it’s a race that Godolphin have been trying to win for more than 20 years. “To be the first British winner and to have the first winner for Godolphin was huge and a great way to finish off the year. “You get sucked into it all and it is not until you watch the replays that it sinks in a bit more. For all the success Appleby has achieved this year, it would not be possible without the continued support of Godolphin supremo Sheikh Mohammed – something of which he is grateful for and hopes will continue for many years to come. He said: “I have a very good relationship with Sheikh Mohammed, I have been with Godolphin for 21 years and know what their vision and goals are. “Sheikh Mohammed built the operation to be an international stable that was to be competitive at the highest level and hopefully this year has helped fulfil that.